How can I find out about my membership status? All membership information is maintained at AFP Headquarters in Virginia. You may check your status by visiting www.afpglobal.org. Of, you can click on this link. AFP's phone number is 800-666-3863. How do I join AFP? Click Here to get started. You'll complete a registration profile and begin the registration process. Where do you meet? Most regular chapter meetings are held at the William Lyon Center for Scouting, 1211 East Dyer Road, Santa Ana. It is one mile west of the 55 Freeway. Free Parking. When do you meet? Our regular chapter meetings are held on the 4th Tuesday of every month except November and December. In November, we host National Philanthropy Day and in December our chapter meeting is held during the first 10 days of the month to avoid holiday schedule conflicts. 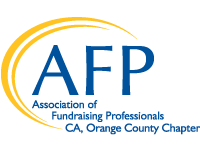 The typical meeting consists of two parts: 1) 10:30 a.m. - Advancing Fundraising, a session on fundraising strategies and 2) Luncheon, followed by a speaker covering a topic of interest to all in philanthropy and non-profit organizations. Your registration fee covers both sessions. Who can attend chapter meetings? Chapter meetings are open to anyone. How much does it cost to attend a chapter meeting? If you are a member, for most events the cost is $39 if you register online by the Friday (at noon) before our meeting. Member registrations after that date are $49. If you are not yet a member, the cost is $49 if pre-registering and $59 at the door. For all chapter meetings you can register at the event. How much does it cost to join? There are various options for membership. Click on About our Chapter/Join on the blue bar above for more details. The most popular membership option cost is $325 per year, $250 of which is directed to the international organization and $75 to the local chapter. Click Here to begin the application process. What is National Philanthropy Day? This event started right here in Orange County in 1986 and is now celebrated around the world in hundreds of locations! The event honors those who have contributed greatly to our local non-profit organizations through financial resources or service. Each year, people are nominated in a variety of categories and each nominee is honored at the event. Outstanding Honorees are brought to the stage at the event and address the audience, which typically is made up of more than 700 community leader and philanthropists.